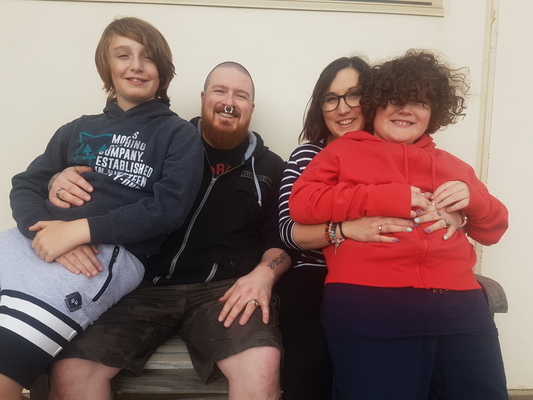 After practically “living” at Royal Children’s Hospital as a teen, Armstrong Creek’s Karen McKenzie returned decades later when her son stopped breathing. Karen was living in Melbourne when Phoenix stopped breathing for 20 seconds in August 2008. “It felt like forever,” she said. “Even with the dim light I noticed he had turned blue. I picked him up and he felt like a rag doll. She rushed her three-week-old firstborn to the hospital where staff diagnosed him with a floppy larynx. From birth Jackson had wheezy breathing that doctors initially thought was fluid on the lungs. But after the new diagnosis Karen could monitor her son for warning signs before he grew out of the condition. The emergency visit was homecoming for Karen, after doctors diagnosed her with Crohns Disease in 1996 at age 13. Weeks earlier Karen and her mum got gastro, but she got worse as her mum recovered. Her GP referred her to Royal Children’s Hospital doctor Don Cameron who diagnosed the debilitating bowel disease, which can cause severe malnutrition. Hospital surgeon Keith Stokes guided Karen through the first of 15 surgeries over 23 years to combat the disease. “Without them I don’t think I would have coped,“ she said. She had to endure stomas, bodily openings surgeons created to help cope with her condition, and resultant teasing at high school. “As a 15-year-old at school, that was very difficult,” she said. But Karen became stoma-free in 2009 and had two sons, who watch the hospital’s annual Good Friday Appeal on TV with her. As a teenager she watched the appeal to look out for her friends with cystic fibrosis or two male nurses who sang to the children. “I always watch to see all the people I know,“ she said. 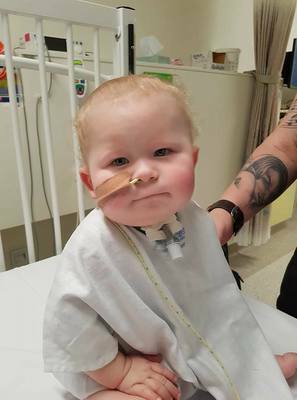 Corio’s Marnie Thompson and Andy Frith will also get behind the appeal after Royal Children’s Hospital saved their son Jaxon. “We wouldn’t have our son if it wasn’t for them,” Andy said. At 20 weeks gestation Jaxon was diagnosed with ventriculomegaly (dilated ventricles in the brain) but it was the least of the family’s problems. Eight days after birth, medical staff discovered several holes in his heart and various other life-threatening issues. For months his parents could not even hold him as doctors performed multiple surgeries. “It was absolute torture,” Andy said. His parents commuted daily from Geelong for six months before Jaxon finally arrived home with a breathing tube in his throat. The brave youngster recently celebrated his second birthday and is learning to talk through his speaking valve. “He’s getting up and walking around the place and he’s always smiling,” said Andy, who gave up his job to look after his son. Geelong has raised $6,781,542 for Royal Children’s Hospital since 1974, including $101,056 last year.